Within a year since its launch, Los Angeles-based World Peas™ Brand Peatos ™ has become a national sensation, winning over taste buds across the country. For decades, corn and potato snacks have ruled the salty snack industry, but in 2018, World Peas introduced Peatos and provided “junk food without the junk.” Peatos is driving growth in plant-based snacking and has become the fastest-growing snack brand in the produce section in thousands of stores across the country, according to retailer data. The brand has quickly become a top-ranking category leader in several markets nationwide, including Southern California, the largest and most competitive grocery market and is expanding its footprint on the East Coast with the addition of Stop & Shop. Growing demand for protein and plant-based alternatives are merging and driving huge growth in categories such as meat, seafood, cereals and pasta from brands like Beyond Burger, Impossible Foods, Good Catch, Ripple, Love Grown Foods, and Banza. World Peas Brand is disrupting the $28 billion chip and “junk snack” category, with a new class of plant-based junk snacks that directly challenges the status quo. It is a deceptively simple notion, to replace the underlying corn or potato base prevalent in traditional salty snacks with a nutrient-dense, non-GMO pulse base and then clean up the seasonings. Common pulses include peas and lentils, which are full of plant-based protein and fibers. The strong growth in new product launches for plant-protein based foods and beverages continued into 2018, with no signs of slowing down. Purposeful snacking has become one of the key trends shaping the food and beverage industry, which ties into the plant-based movement, according to research by Dupont Nutrition and Health. 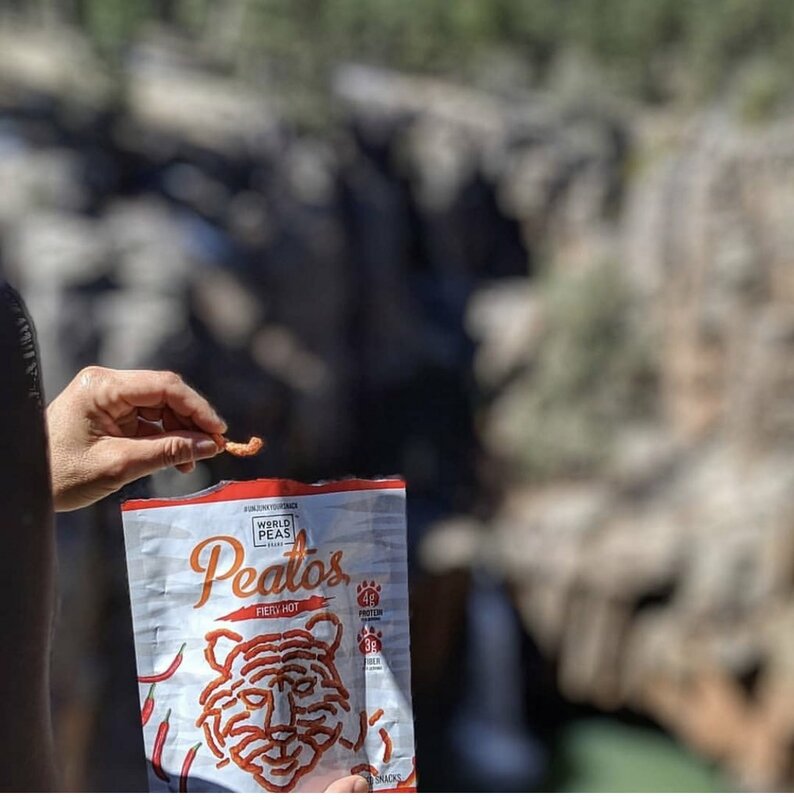 Peatos are a plant protein-based crunchy, puffed snack made of pulses that have twice the protein (4 grams) and three times the fiber (3 grams) of Cheetos® per serving. Peatos also boasts clean, non-GMO ingredients, has no artificial flavors, no synthetic colors and no added MSG. Striking flavors include the popular Classic Cheese, Fiery Hot, Chili Cheese, and Masala. Peatos are currently available in the produce sections at Kroger and its banner stores including Cala Foods, City Markets, Copps, Dillons, FoodsCo, Fred Meyer Stores, Fry’s, King Soopers, Mariano’s Fresh Market, Metro Market, Pick ’n Save, QFC, Ralphs, Food 4 Less, and Smith’s, as well as Vons, Pavilions, Albertsons (SoCal), Safeway (NorCal), and online on Amazon. In addition to the traditional grocery channel, Peatos™ has developed a strong following in the office foodservice arena with several prominent tech companies serving Peatos on their campuses, and can even be found in green rooms from Hollywood to New York. To reinforce the public’s positive reception of the brand, Peatos has won numerous awards, including the Editor’s Choice Award for Best Salty Snack from Supply Side CPG, Editor’s Pick Award from Progressive Grocer, and The Best New Product Award from Convenience Store News. Over the last few months, Peatos has captured nearly 5 million audience impressions with over 200 media hits in top tier outlets and trade and online publications, including Men’s Health, Wall Street Journal, Today, Cooking Light, The Los Angeles Times, and was recently featured as The Snack of The Day on a nationally syndicated health talk show, featuring TV’s most famous Doctor. World Peas Brand™ Peatos is revolutionizing snacking by creating better-for-you plant based “junk food.” Peatos™ replaces the common corn or potato base in traditional chip style snacks, with a nutrient-dense, pulse base (e.g. peas and lentils). Peatos are a pulse-based crunchy puffed snack that delivers the bold flavor and big crunch snacking experience we all crave, without the empty-calories. Peatos aims to #unjunkyoursnack thanks 4 grams of plant-based protein and 3 grams of fiber per serving. Find us on Facebook.com/worldpeasbrand and on Twitter and Instagram @worldpeaspeatos.